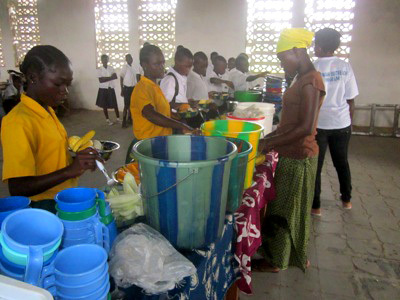 LAWCS (Liberia Animal Welfare and Conservation Society) spent the month of November reaching over 10,000 students with an inspiring message about the importance of a vegan lifestyle. 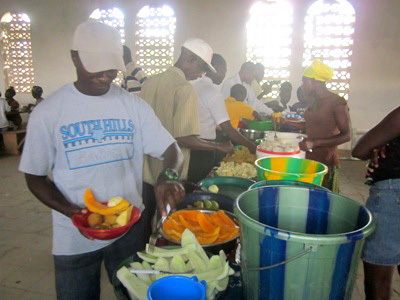 To conclude the program, LAWCS held a Vegan Day and provided free, delicious vegan food. LAWCS Vegan Outreach Program was sponsored by FARM’s Sabina Fund. 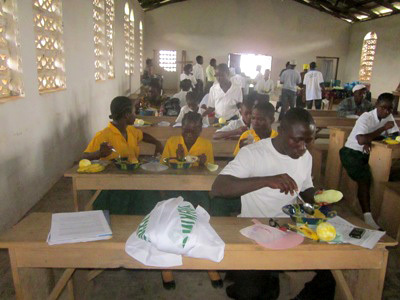 It gave Liberian students and teachers an insight into the healthful benefits of vegan food, and even more importantly, it stressed that animals are sentient beings, to be treated with compassion and respect. 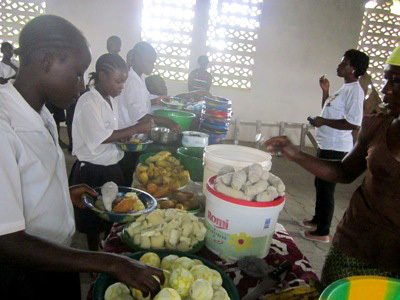 The program was a tremendous success, and the Liberian Ministry of Health has asked that it be expanded to hospitals and clinics so that patients can learn how to adopt a more compassionate and healthier diet. Active since 2001, LAWCS conducts programs on a whole range of animal issues, from humane policies for community dogs to educating people about how to protect wildlife and forests. To learn more about LAWCS, please visit their website. Click here. One of the last few nesting pairs of Blue-throated Macaws in the wild, Bolivia. Ara glaucogularis. More info and photos here. December 2013: The Barba Azul Reserve, which is located in the Bolivian Beni and protects the world’s remaining population of blue-throated macaws, has secured the purchase of 14,827 acres of natural savanna and forest habitat to more than double the size of the reserve to 27,180 acres. The extension by Asociación Armonía is significant because it will protect a mosaic of tropical grasslands, as well as two large palm forest islands, a small central river, water-edge short-grass habitat, and more than 20 small isolated palm islands. Thanks to the outstanding work of C.R.E.L., this dog is now free to run and play in the snow. C.R.E.L., a network of animal rescuers throughout France, has for several years been extending a very much-needed helping hand to the Spanish dogs called “galgos,” who are Spanish greyhounds. The galgos (and “podencos,” a similar breed) are used for hunting in Spain. The hunters treat them with extreme cruelty and keep them only for the duration of the hunting season. Kind people in Spain, many of whom run shelters, devote their time to saving the many thousands of galgos every year who need shelter, rehabilitation, and forever homes. These Spanish rescuers are dependent on animal people outside Spain for material support for their work, for transportation for the dogs, and for loving homes in other countries to adopt the dogs. C.R.E.L. has been working for several years to provide much-needed assistance for these beautiful dogs so that they can recover and go on to live happy lives with their new families. 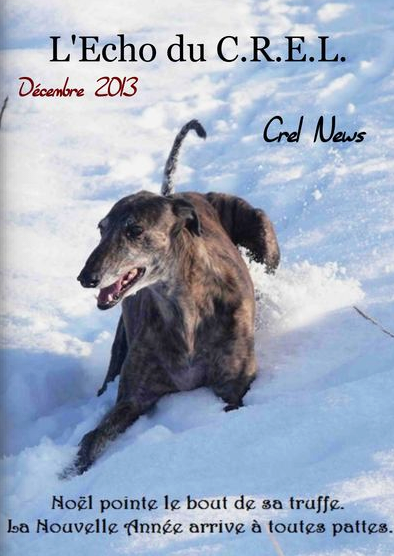 To read C.R.E.L.’s newsletter, in French, click here. Photo: Courtesy of C.R.E.L. / A rescued galgo who can now run and play in the snow. In the year 2000, VSPCA (Visakha Society of Protection and Care of Animals) began their program of protecting a large colony of Painted Storks at Telenelipuram, in Andhra Pradesh, against poaching. They have continued to work with the local people to provide a safe environment for the storks. This year with support from the Winsome Constance Kindness Trust, VSPCA is developing a full fledged team of vets, paravets, and helpers to keep an eye on the birds, to help with their protection, vet care, and to assist chicks who’ve fallen from their nests. During recent storms and severe flooding, VSPCA, with the expert wildlife rehabilitation help of Saleem Hameed, along with several other organizations, was able to save thousands of stranded Asian Open Bill Storks. 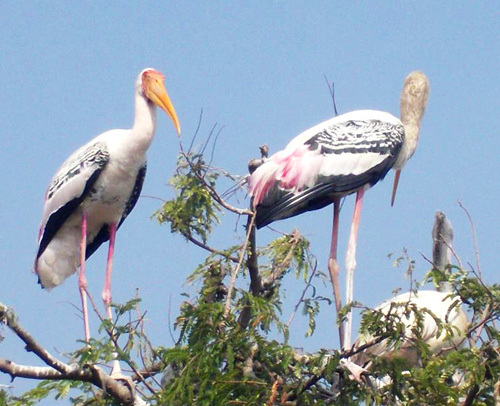 They took off on their yearly migration in November, and VSPCA has turned their attention again to the Painted Storks of Telenelipuram. These beautiful birds need ongoing help to stay safe. To visit the Facebook page of VSPCA, click here. Photo: Courtesy of VSPCA / Painted storks at Telenelipuram. Ahmed El Sherbiny, Chairperson of ESAF, has written to let us know that the 50 member Constitution Committee, charged with drafting the new constitution of Egypt, has determined that animal welfare issues will be included. This represents a huge step forward as only a few countries in the world make mention of animal welfare in their constitution. 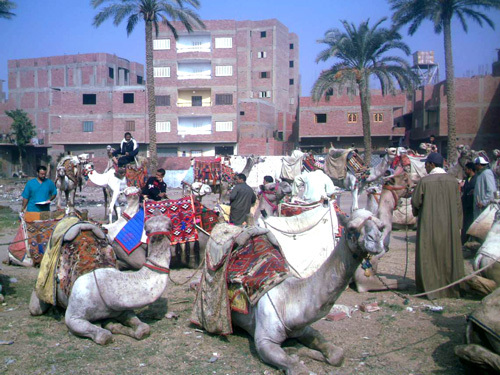 Many Egyptian animal welfare groups worked together to bring this about. Among them were The Brooke Hospital, SPARE, ESAF, The Donkey Sanctuary, AWAR, and ACE Egypt. Congratulations to the Egyptian people for joining the ranks of countries that make a special place for animals in their constitution! Photo: Courtesy of ESAF / These camels are benefitting from ESAF’s feeding and vet care program for working animals at the Pyramids. Wolves still need protection, but may be delisted anyway…. WASHINGTON, DC, December 17, 2013 (ENS) – The public comment period closed today on a proposal by the U.S. Fish and Wildlife Service to remove federal protections for all gray wolves across the country. Close to one million Americans stated their opposition to the plan – the largest number of comments ever submitted on a federal decision involving endangered species. Also today, conservation groups challenged as “premature” the Service’s removal of federal Endangered Species Act protections for gray wolves in Wyoming. Arguments were heard at the U.S. District Court in Washington this morning. The court’s decision will determine whether Endangered Species Act protections will be restored to gray wolves in Wyoming unless and until state officials develop a stronger wolf conservation plan. It’s Winter, and it’s the time for the arrival of Migratory Birds from Europe, Central Asia and Siberia to the wetlands of Pakistan. Several endangered migratory birds including Siberian cranes and bustards are being hunted indiscriminately. Both species of the migratory birds flying into Pakistan from Siberia during the winter months are listed in the Convention on International Trade in Endangered Species (CITES) with 14,000 other endangered species in Pakistan including birds, other animals and plants. The locals have been found shooting at flocks of Siberian cranes flying overhead during winter with their AK-47 machine guns just for leisure and on the other hand members of royal families from the Middle East, particularly those in Saudi Arabia, are often given licenses to hunt endangered migratory birds, such as bustards, despite the stringent restrictions. International laws are been violated. These birds are of much Ecological importance as they prey on insects and weeds and thus contributing towards the betterment of Agriculture and Environment. In an era of unstable climate change the environmental disaster is elevated by the mass killing of such birds. I request your honor to kindly take strict actions against hunting of Migratory Birds in Pakistan and impose a complete ban on hunting of these Birds. I, hope that this request will get your kind consideration and mercy towards your “Guests” the beautiful and innocent Migratory Birds. 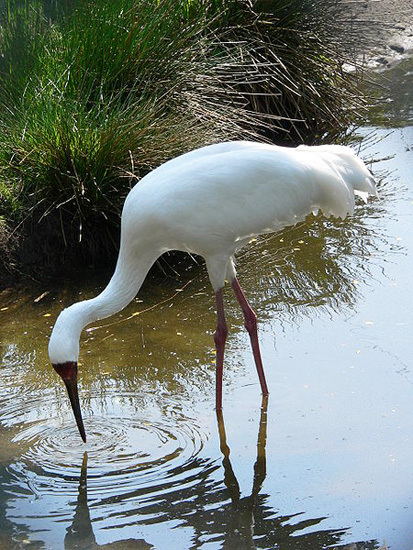 Photo: Photographer: BS Thurner Hof / Wikimedia commons / “This file is licensed under the Creative Commons Attribution-Share Alike 3.0 Unported license.” / A Siberian Crane; this one is in captivity in a zoo.